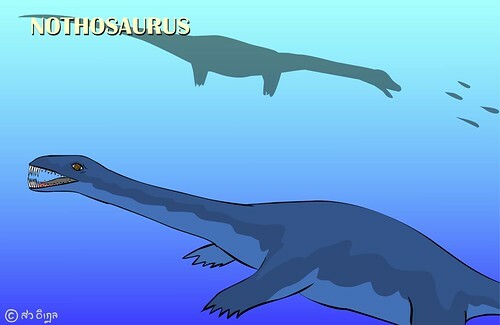 Nothosaurus was the swimming dinosaur which had the long-sharp teeth at front. These teeth made it could not close its mouth. This mean Nothosaurus mouth could help the breathing system. Nothosaurus long neck and small head tell us that its food was fish, especially the small and fast fish. Roll mouse over the small dinosaur, you will see how it follows the fish.